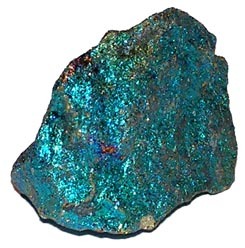 Chalcopyrite is sometimes found as crystals. It fractures like glass and is brittle and is only 3.5 to 4.0 on the hardness scale. If you scratch it on a white porcelain plate the streak of powder left behind is dark green. Chalcopyrite is CUFES2 and bornite is CU5FES4.